Forklift Certification Baltimore, Get Forklift Certified Today! 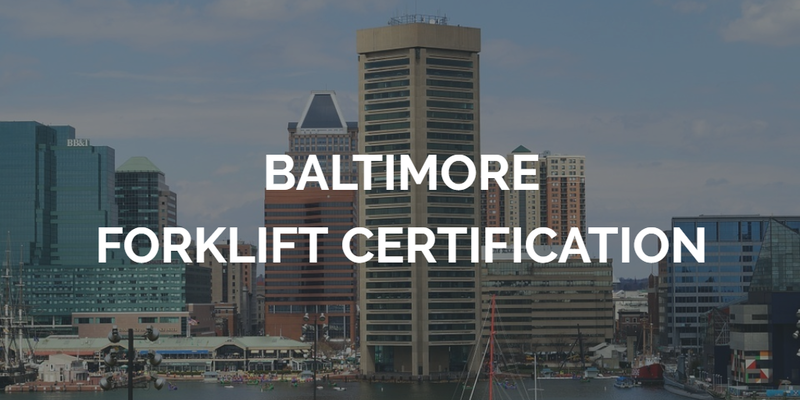 Sign up for Forklift Certification Baltimore today! While the city might be famous for being the hometown of Babe Ruth and for having some of the best seafood in the country (especially crabs! ), Baltimore, Maryland is also full of excellent job opportunities for individuals with forklift certification MD. Baltimore serves as the midway point between the North and the South of the United States, making it a major hub for transportation in both directions. Baltimore is also home to many other industries, such as fishing, shipping, mining, logging, and construction, which are always looking for people with a Baltimore forklift certification. Baltimore employers require well-qualified forklift operators. If your employees need forklift certification in Baltimore, CertifyMe.net has the tools and resources to help your entire company achieve OSHA compliance. Browse our course catalog, and select the Baltimore forklift certification you need. In the event of an accident or injury with your forklift fleet, OSHA will audit or investigate the root causes. With CertifyMe.net, all your employees’ training records are accounted for. That’s priceless peace of mind for any Baltimore employer. Sign up with CertifyMe.net for your complete forklift certification in Baltimore requirements! Why Get Forklift Training in Baltimore MD? Our Baltimore, MD forklift training program can help you with Baltimore forklift certification, from small-sized businesses to major corporations with multiple locations. Our training program is also a great idea for employees. You can get forklift certified in Baltimore, MD with CertifyMe.net’s individual program. When you’re applying for forklift jobs in Baltimore with a forklift certification MD, you’ll place yourself ahead of the competition as employers are constantly looking to save time and money on employees who are already trained. You may even find yourself with a better position and increased pay then you would otherwise. Now that you know that a Baltimore forklift certification can open the doors to great career opportunities in Baltimore, it’s important to know which type of training you need. Choosing an OSHA-compliant forklift certification in Baltimore will prepare you to operate forklifts the best and prevent accidents on the job. This training is available for all of your employees directly through our website. Baltimore forklift certification has never been this easy, or more affordable. Don’t tackle your training requirements by yourself – sign up with CertifyMe.net, and enjoy the advantages of having an OSHA training expert in your corner! In addition to going through a personal certification process, many employers will offer forklift training in Baltimore. Maryland’s economy is incredibly diverse, providing job opportunities in agriculture, manufacturing, military contracting, natural gas production, shipping, construction and more. One of the biggest employers in the region is the Giant Food grocery chain, which offers many forklift jobs in Baltimore MD for those with forklift certification MD in Baltimore, including warehousing and shipping. Black and Decker, a manufacturer of power tools and other home improvement products, also provides plenty of job opportunities to those living in the Baltimore area. The Chesapeake Bay and the Port of Baltimore are also hives of activity for regional and international shipping. With billions of dollars worth of cargo moving through the port every day, there is a tremendous amount of forklift operator jobs in Baltimore Maryland for those with forklift certification Baltimore to assist with loading and unloading and other transportation needs. Now that you know the importance of forklift certification Baltimore and the type of training program you need, you need to choose your training course! There are many types of forklift training programs out there, including many in person classes in Baltimore, but we want to encourage you to look for an online program. No other Baltimore forklift certification program matches CertifyMe.net in terms of value, complete OSHA compliance, and lifelong support! Plus, our forklift certification in Baltimore includes renewal training, which is required by OSHA every three years. Worried that an online course won’t be as comprehensive or high quality as an in person program? Think again! The online forklift classes from CertifyMe.net are designed to take you from beginner forklift operator to expert, all from our online platform at your own schedule. As forklift experts ourselves, we know everything you need to know to protect your safety at work, be efficient, and qualify for the best forklift jobs in Baltimore. You will also be totally compliant with all OSHA regulations. CertifyMe.net offers the most convenient and comprehensive online forklift training in Baltimore, MD available. The forklift certification Baltimore program teaches students everything they need to operate forklifts safely and properly, including how to operate the controls, how to inspect the equipment and the surrounding environment, and how to recognize and avoid hazards. Once you complete the online course, which typically takes one hour, you’ll have your certificate in hand and will be prepared to be the best possible operator. Your expertise will qualify you for the best forklift jobs in Baltimore MD with higher pay and more advancement opportunities from your employer. Get your employees their Baltimore forklift certification today. It’s the best move you can make for your company. Well-trained employees are happy employees – and more productive, too! Create an account today on CertifyMe.net and complete your forklift certification Baltimore!